What a day. 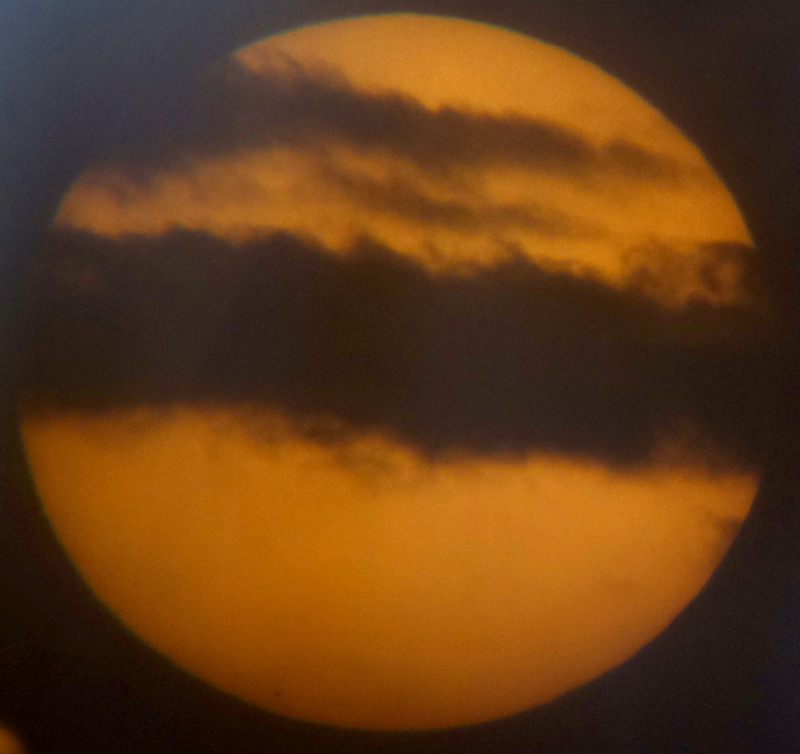 Incredible to watch one of our neighbouring planet block out some of the Sun’s light. 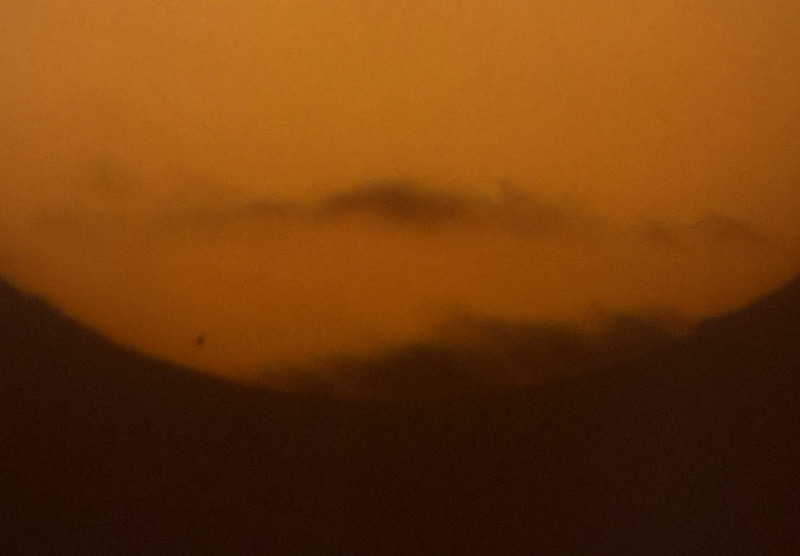 Mercury is the small round dot below and to the left of the plane. 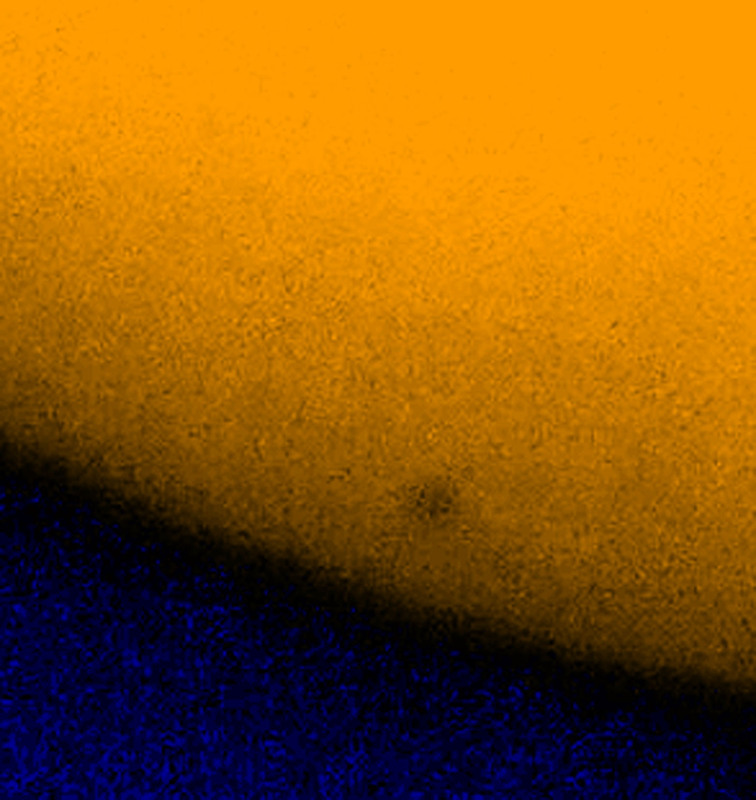 The biggest sunspots are above and to the left of the plane, but some small ones near Mercury too. 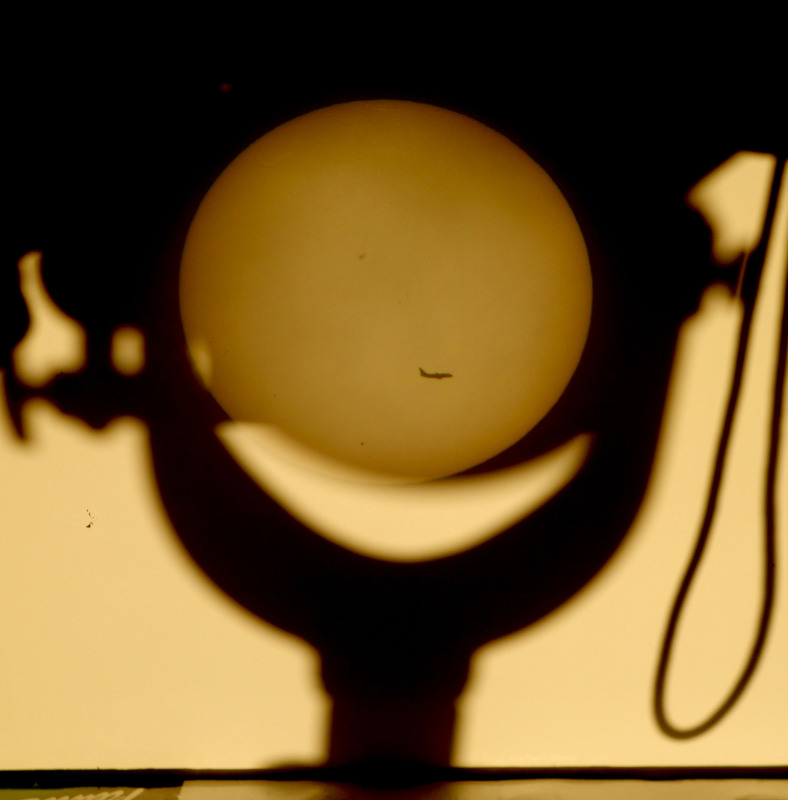 The shadow of the telescope frames the shot. 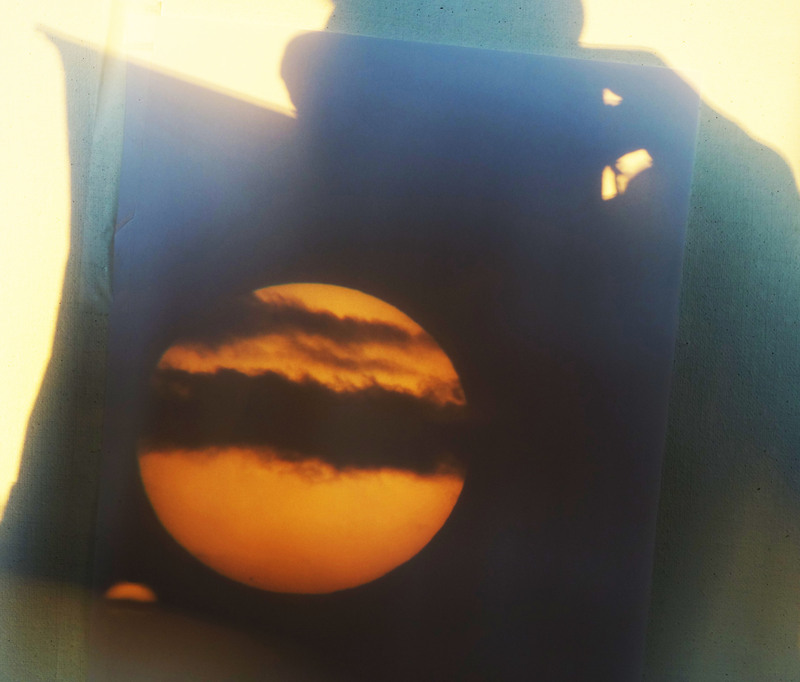 Here the clouds and Mercury, sunspots and the Sun and my shadow too. Mercury is just at the lower edge late in its transit. A whole planet – just a dot on the face of the sun. Nice clouds too. 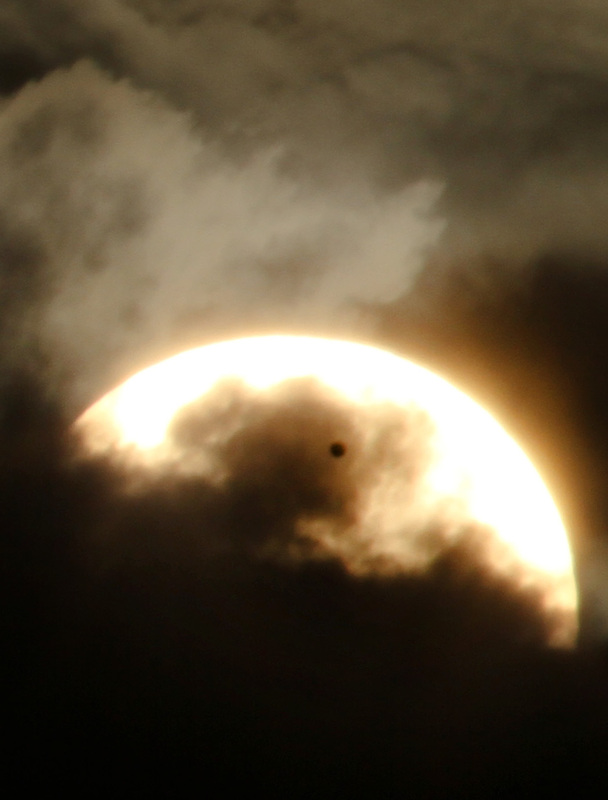 So this is a portrait of Earth, Mercury and the Sun together! 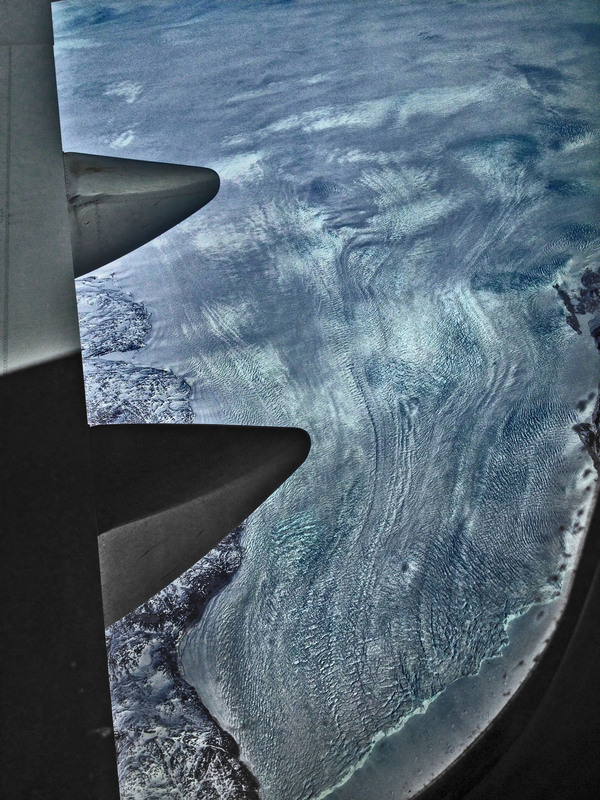 A view of the Sermeq Avannarleq glacier in Western Greenland and its ice front, 29th May 2013. Take out the window during a flight from London to San Francisco. I did not know which glacier it was until late September when I found it on Google Earth at 70° 3’3.24″N, 50°19’1.22″W. Click on the photo for a full size view. According to the Byrd Polar Research Center, the Sermeq Avannarleq glacier lost 2 square miles from its ice front in 2007 and again in 2008. Increasingly rapid movement of this and other glaciers in south west Greenland is likely caused by surface melt waters percolating into the glacier, warming and lubricating the ice. 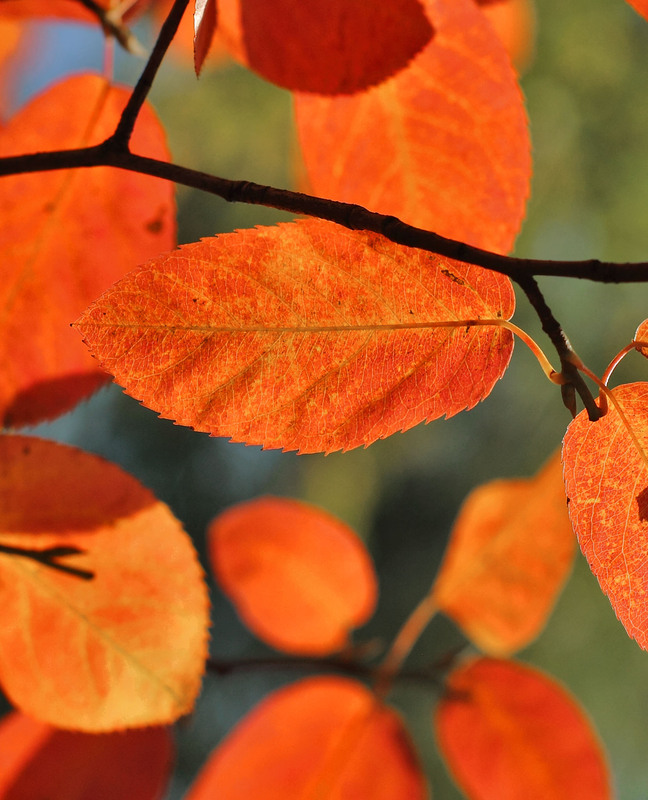 You can find more scientific details in the AGU press release about Phillips et al., 2013. This sculpture is a golden batwing. I designed and was so fortunate to visualize this stunningly gorgeous shape in 1992-1994. I had no idea before I visualized the 1/8th cell how beautiful it was. 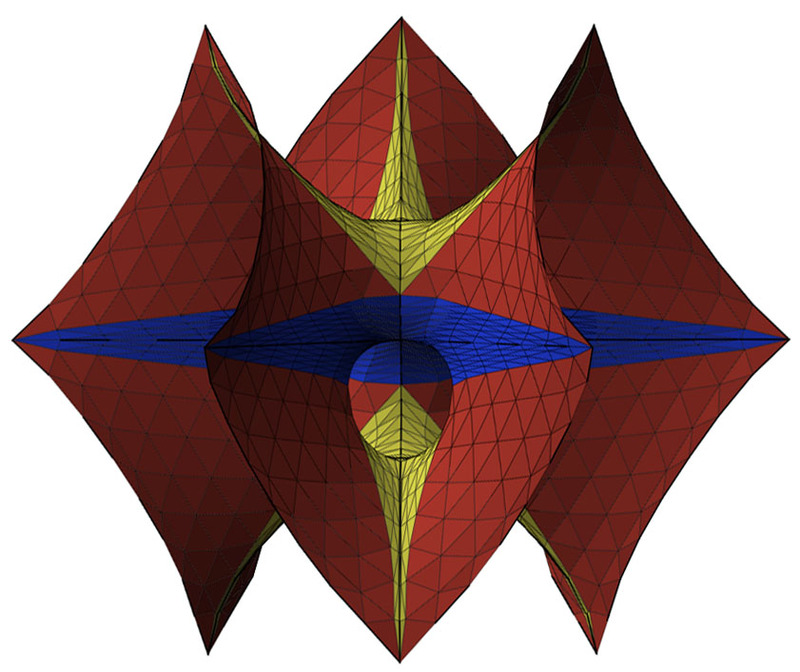 In loose mathematical terms, the batwing is a genus 25, infinite, triply-periodic minimal surface. Here you see 1/8 of the whole unit cell. In 1992, I was intensively searching for a surface in which I could embed vertex points of the geekily famous Weaire-Phelan structure. Using combinatorics, I had predicted the existence of a genus 25 minimal surface that would fit. I called it the “genus 25 surface”. This turned out to be the surface Ken Brakke later named the batwing!! I built the earliest 1/8th model by hand out of thousands of pieces of masking tape in 1993 using a wireframe dipped in soap as a guide. It was first published as a 3D CAD model in Multi-CAD magazine (1993) and was publicly reported as the “evolved” surface in 1998. Alan Schoen found evidence for it around 1970, but this remained tucked away in his unpublished notes for 3 decades. In 1999-2000 Alan built his first 3D model of the 1/8th and full batwing, using Surface Evolver together with Ken Brakke. The surface reminded Ken of a bat wing when he was working on it, and thus he named it so. You can easily print the batwing as a 3D object. See the Shapeways.com website. Just get the file ready, send it to the printer (and order it via their website), and voila, they ship it to you in the mail. I received my first one in white polished plastic today!! You can find this exact model on Shapeways’ website along with other beautiful versions of the Batwing by Ken Brakke, Alan Mackay and others. 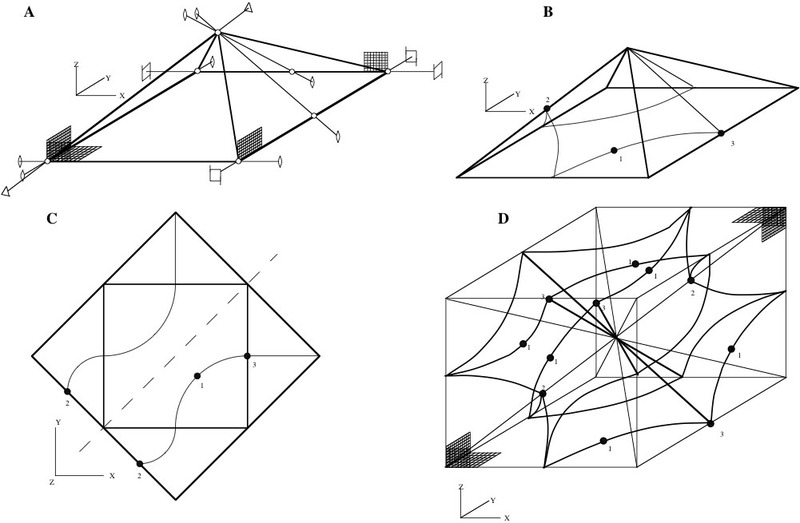 The basic mesh for the batwing surface was computed using Surface Evolver software (Ken Brakke). The surface was solidified and submitted to Shapeways. 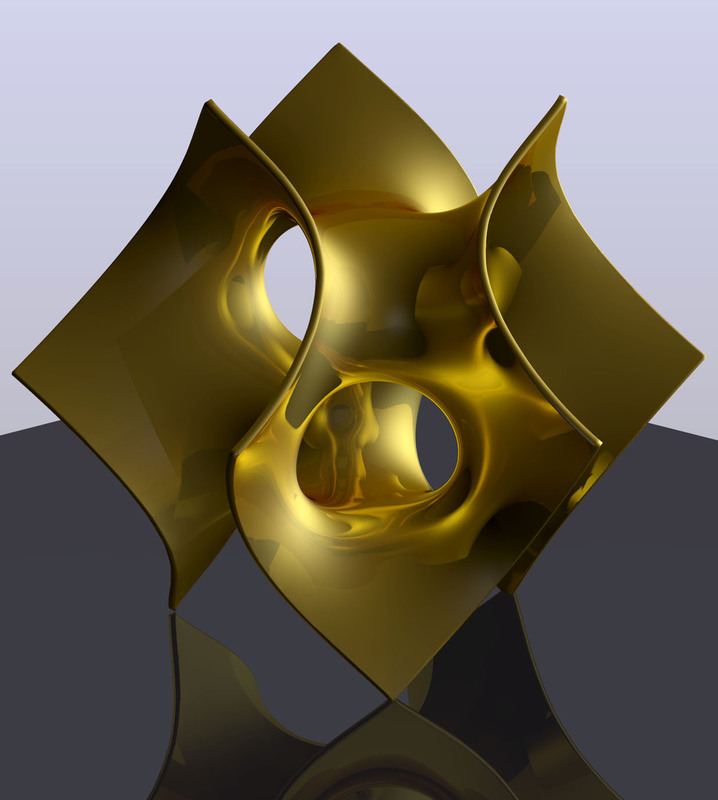 The model was rendered in gold for the image using Blender 2.48 and 2.61. 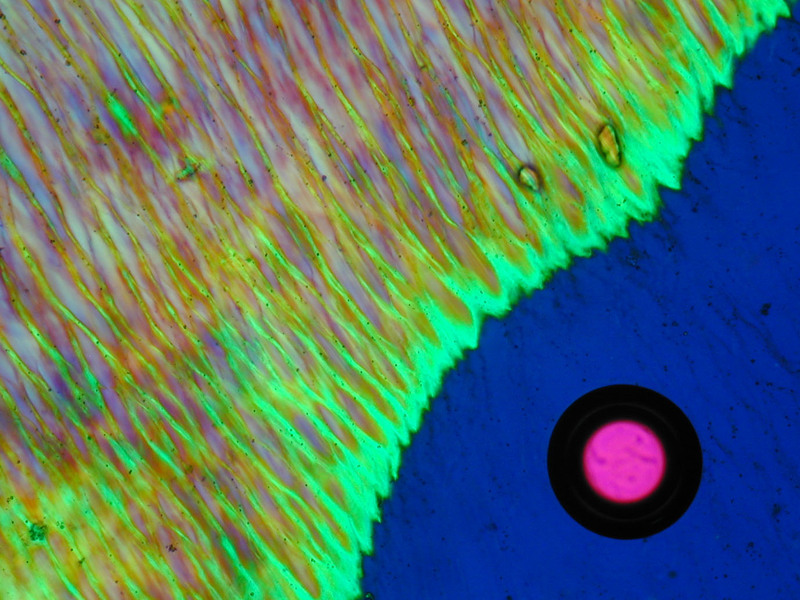 The gold surface required meticulous fine tuning of optical properties in Blender. For instance, the reflectivity and colours were set and made to depend on angles and refractive indices. Five lights were used to illuminate the scene. A long focal length camera kept the perspective effects small. Here is the original cover and article from a popular CAD magazine featuring the earliest published batwing surface I can find. 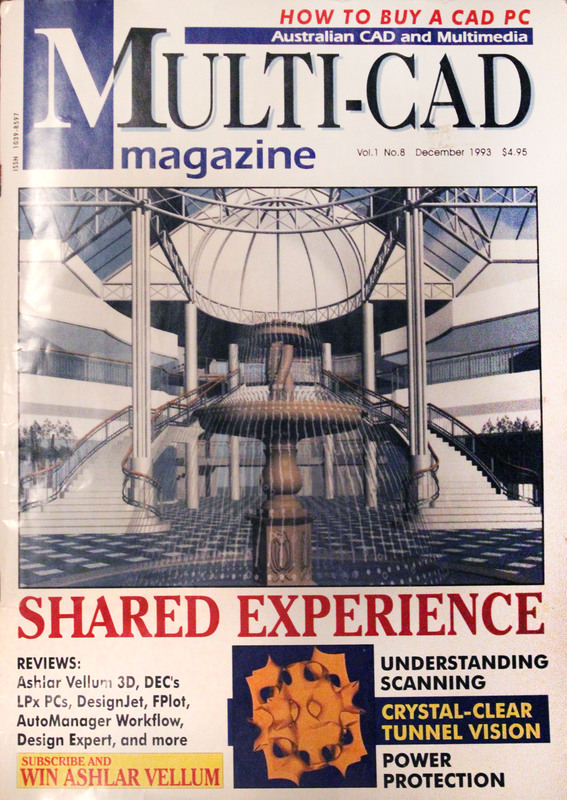 The magazine was aimed at users of 3D CAD primarily in architecture and design. Chris Wilkinson showed me how to use the 3D software that we used back then (Qikdraw 3D). B-spline approximations were used for each small surface piece. See the article. Corkery, R. W. Crystal Clear Tunnel Vision. Multi-CAD Magazine (Echo Magazines, Brisbane Australia) Vol 1. No. 8, 1993. 2013 and 1993 representations of the full batwing. 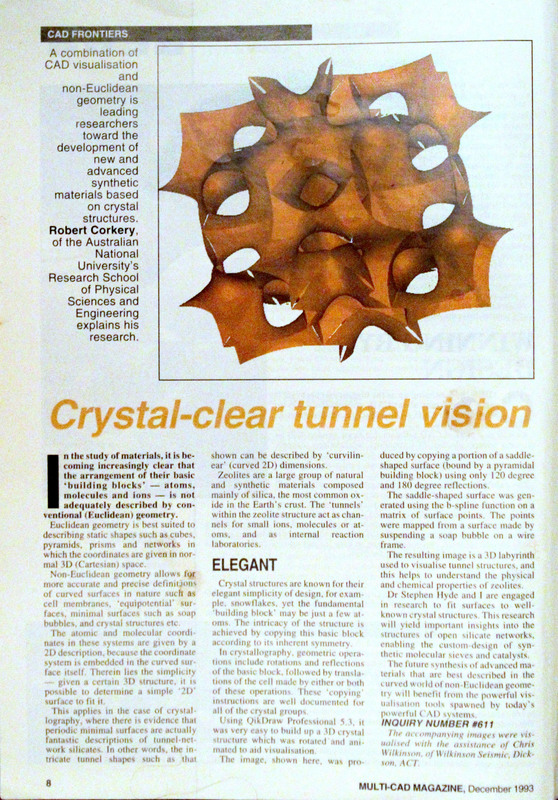 My original batwing in 1994, as output from Surface Evolver using the wire frame model below from 1992/1993. Thanks to Ian Barnes for help with Evolver.